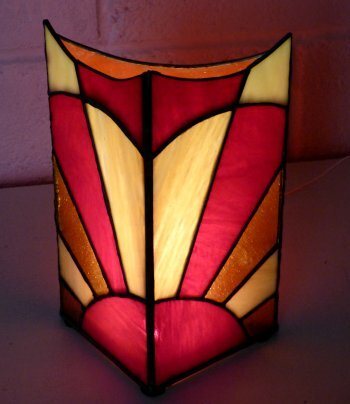 Learn the basics of foiling stained glass and make a stylish lamp in just three days or over 6 evenings! Weekend course is suitable for those who've done some glass work before. 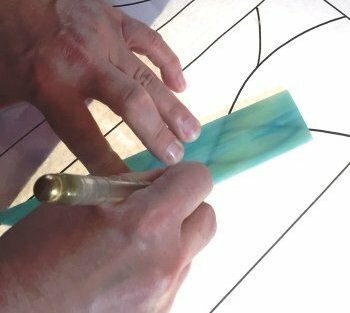 This introduction to the foiling method of stained glass construction (also called the Tiffany method) will give you a good grounding in the essential skills. 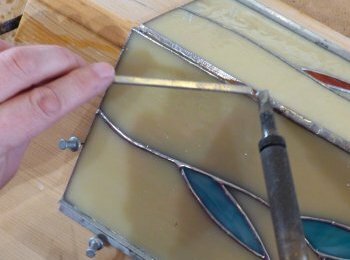 You'll get lots of hands-on experience with the tools we use, plus tips, tricks and a little history about this contemporary form of stained glass and you'll make a lamp to be proud of! Our classes are suitable for anyone over 16, although we do advise that anyone with a medical condition that limits their hand strength or control contact us before booking to discuss. With a maximum of 4 students on the lamp-making course and two tutors you can be sure of plenty of attention and guidance throughout the class. Making your own stained glass lamp requires a number of specialist techniques, making this class suitable for those who've tried stained glass before..
After a short health & safety discussion, we'll start by refreshing your glass cutting skills. Once comfortable with scoring and breaking the glass, you'll work on your own mini project - introducing you to the basic techniques and tools you'll need for your lamp project. Students may choose from three starter designs, and a range of coloured glass to work with. Your lamp will have 3 or 4 sides, and be similar in size to lamps we sell in the gallery for around £200). 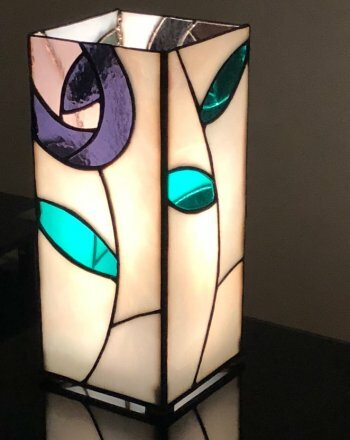 The workshop cost includes the LED lamp to finish off your lamp - a complete package that's sure to make you want to continue to develop your stained glass skills! Making a lamp - stretch yourself! This workshop offers a number of further challenges compared with our original beginners foiling class, making this class of interest to those who've already done some stained glass. You'll learn about cutting opal glass using a lightbox, tools and tips to aid precision grinding (to ensure your lamp pieces all fit properly). You'll also discover the use of soldering jigs (essential for 3d objects) and how to assemble the sides in to a robust structure. Finally, you'll find out how to solder a spider into your lamp and how to mount the LED lamp inside. You'll finish off your lamp with an optional black patina to enhance to look of your lamp. Your lamp to take home and enjoy! If you're ready to book, choose the date and course option you prefer and use the PayPal buttons to make your booking. You can pay by card or PayPal; if you don't have a PayPal account, just check-out as a guest to use a debit or credit card. Please note - on the three-day workshop the finish time on the 2nd and 3rd day depends on you! We suggest you don't make fixed plans for after the class on any day in case the sessions take longer than usual. Start time - 9-45am. We may be able to accommodate you on a weekday or different evening by prior arrangement if you're unable to attend one of the evening sessions. A 3-sided lamp made by student Sarah - gorgeous! "Attended another course here previously and have booked another course. Enough said!" "Overall, Excellent! Easy to understand, helpful and plenty of good humour." "Fantastic starting place for novices. Lots of fun and the day flew by!"